Jesse Free, now a Light Rail Vehicle (LRV) lead operator, has lived in Kitchener for the past 20 years. He had no interest in the new ION light rail until he was offered a job to be an ION as a driver and to train others to drive it as well. This past Saturday, Free proudly showed off the workings of the LRVs to local residents at the ION light rail’s open house event, and demonstrated excitement and enthusiasm toward its upcoming launch. The open house provided local residents with a great opportunity to learn about the ION light rail’s function, as well as the chance to explore the inside of the modern and spacious LRVs. ION is the Region of Waterloo’s rapid transit system. The ION light rail transit system (LRT) has been in the making for the past five years and is finally undergoing its last handful of test rounds before service will officially begin in spring 2019. 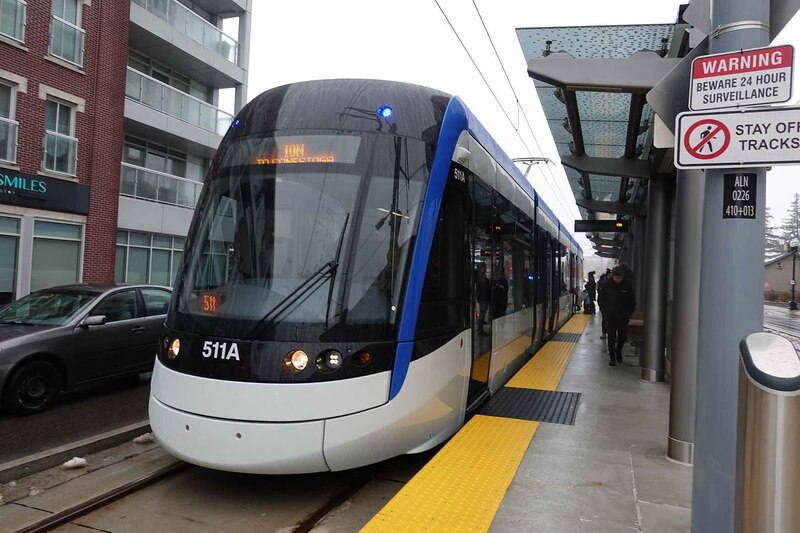 This LRT is the first of its kind and is attracting attention throughout North America. It was locally designed as a grass roots project, and was tailored to Kitchener-Waterloo and its transit users. The LRVs can travel at a maximum speed of 88 kilometres per hour on the light rail, and can get passengers from Conestoga Mall to Fairview Park in just 45 minutes, compared to the bus, which can take anywhere from 55 to 75 minutes depending on the time of day. During peak hours, the LRT will be scheduled to have a train pass each of the 19 stations every seven minutes, meaning that it will have 12 of its 14 cars running at once. The last train of the night will pass at around 1:30 a.m. and the sweep car will clear the tracks of debris every morning at 5 a.m., with daily service resuming shortly after that. Each train has 75 seats and a maximum capacity of 287 people. Passengers can also bring bikes onto the train and keep them in the accessibility area for the duration of their trip, so long as no one needs that space is using it. The LRT will travel alongside vehicular traffic while remaining physically isolated from the actual paths of cars, busses and pedestrians, except when traversing intersections. As the train approaches an intersection, it will be given priority signaling, meaning that all other traffic lights will turn red as it goes through. At some intersections, there will be physical barriers blocking vehicular and pedestrian traffic as the train passes through. This is controlled automatically using sensors, but the LRV operators also have the ability to do this manually by pressing a button on their control panel. The LRT will run on electricity using a pantograph system, wherein electricity is supplied to the rail’s overhead wires and an apparatus mounted atop the train will collect power through contact with the wire and supply it to the train. The electricity for the LRT’s functioning is supplied by two different electricity suppliers to create redundancy, in order to remain functioning in the event of a power outage by one supplier. In a case where no electricity can be supplied, or the pantograph system malfunctions, the LRV has a backup battery that can keep the train indoor lights and heating/cooling on while passengers wait for a bus to shuttle them through the LRT stops or for another train to replace it. Additionally, police can control traffic at intersections when traffic lights are down, so that the LRVs can pass through safely. Fares for using the LRT system are controlled by Grand River Transit (GRT). University of Waterloo and Wilfrid Laurier University students can use their student ID cards to tap on to the train at the station and to transfer seamlessly to GRT busses. Others can access the LRT services by purchasing an EasyGo card at Charles Terminal for $5 and load it with train tickets or cash value there, at the LRT stations, or at certain retail vendors. Single fare tickets are $3.25 each and monthly passes are $86 ($73 for senior citizens). Once users tap their EasyGo card at the LRT station they are boarding at, a 19-minute transfer window opens to transfer to a bus before needing to use another ticket.